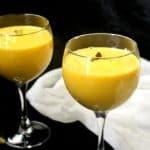 Nothing beats the sweltering summer heat like a tall glass of Mango Lassi. My Vegan Mango Lassi is made with cashew milk instead of yogurt, and it tastes absolutely divine. Cardamom and vanilla complement the tangy sweetness of the mangoes. A gluten-free, soy-free and vegan recipe. 2 cups fresh or canned mango puree. You can also puree frozen mango chunks and use them here. Pour into tall glasses over ice. Garnish with chopped pistachios or mint. I love my lassi thick and creamy, but if you want it to be more fluid, add more cashew milk. You might need to add a little more sugar to balance the taste.